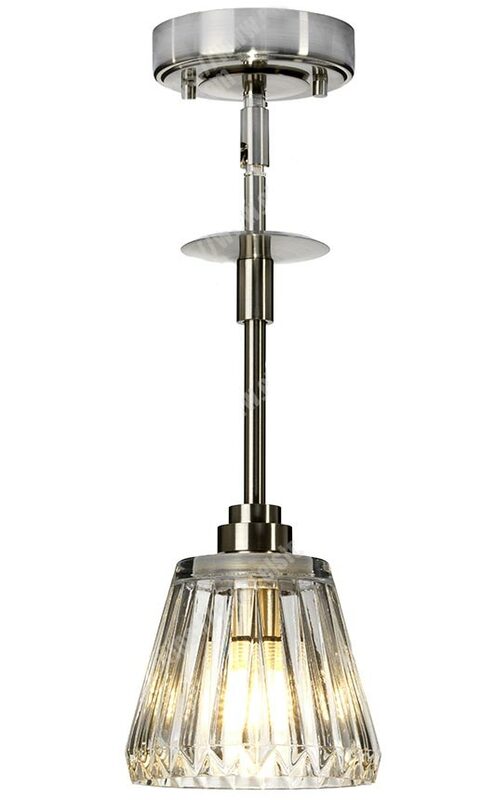 This Elstead Agatha 1 light bathroom pendant in polished chrome with cut-glass shade is rated IP44, inspired by the Olympic torch and features contemporary style. Constructed from steel, with circular ceiling mount, height adjustable rod suspension and downward facing tapered cut glass shade containing an energy efficient LED lamp bulb. If you are searching for a quality pendant to complement your bathroom, this is certainly one to consider. The modern angular lines are suitable for a contemporary setting, whilst the cut-glass shades make it suitable for traditional and period bathrooms too. This bathroom light is supplied by Elstead Lighting, a British company that specialises in the manufacture and distribution of quality decorative lighting such as the Agatha 1 light bathroom pendant in polished chrome with cut-glass shade and rated IP44 you see here. Why not take a look at our other forms of lighting in our main bathroom lights section. There you’ll find lights for your bathroom walls as well as mirror lighting and downlights.